Could you imagine millions of people criticizing the decisions you make? Imagine millions of people weighing in on what you ate for breakfast, the clothes you chose to wear, and the car you drive. In some respects this is what happens to the president, every day. Millions of people critique his decisions, speeches and beliefs. It is safe to say it is an exhausting position. As if being judged by millions of Americans wasn’t difficult enough, he has the added pressure of representing a large minority group. According to the 2010 Census, African Americans make up 13.2 percent of the US population. On Monday, Jan. 21, 2013, President Barack Obama was inaugurated into his second presidential term. There he promised to continue to lead the US, despite the exhausting nature of being the president. While the second term is often referred to as the “legacy term,” Obama’s second inauguration makes Americans reflect on the past four years and consider what may happen in the next four years to come. In Utah, which is an overwhelmingly red state, African Americans make up a mere 1.3 percent of the total population. So would African Americans and other Salt Lake City residents here be proud, disappointed, or indifferent about Obama’s first term and the years to come? Kendra Arado, who is African American, is a junior studying stage management at the University of Utah. She volunteered on the 2008 Obama campaign before she was even eligible to vote. “Of all of his accomplishments, I am most proud of his work on health care. The Affordable Care Act will benefit the lives of millions of Americans. I think that will truly be his legacy,” Arado said. 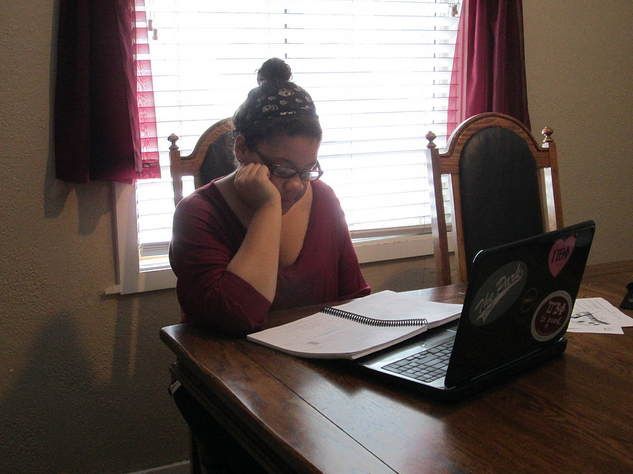 Bridges, an Obama supporter, studying at her home. Zoey Bridges, also African American, is a junior studying biology at the U. Bridges also volunteered on the Obama campaign this year. She felt this election was going to be much closer than the 2008 election and decided to help out. She too is most proud of Obama’s work on health care. Kurt Bagley, a U alumnus who is white, was a field director on the Obama 2012 campaign. He echoed Bridges’ sentiments. Americans, regardless of political affiliation, have worries and concerns about the president. Everyone hopes that he will steadfastly guide the nation through difficult times and be able to make calculated decisions in distressing circumstances. Some Americans may hope he accomplishes his goals or hope that he will reach across the aisle when making policy decisions. Both Bridges and Arado shared the same concern for Obama. Bagley had a different concern. “My biggest concern of his first term was that his opposition in the House of Representatives would ruin the economic progress he had already made,” Bagley said. Obama has another four years in office, so looking forward to the next term Bridges and Arado share some similarities in what they hope Obama will accomplish. Meanwhile, Bagley, who is currently a legislative intern for Planned Parenthood, had concerns about global warming. “I’m hoping that he will find ways to continue to reduce carbon emissions, and take measures to help reverse the effects of global warming,” Bagley said. Making progress in Washington is no easy task. It takes an incredible amount of energy and persuasion to get people to agree. Stanley Ellington, president of the Utah Black Chamber of Commerce, believes that some progress has been stifled because Obama is African American, and furthermore believes a lot of the negativity about Obama is racially motivated. Bridges suggested that political stagnation is just typical of Washington politics. While this is a small sampling of Utahns, it is interesting to see that these individuals can have such different perspectives about the president. What he may symbolize to someone may be entirely different than to another person who also supports him. It seems that no matter what he symbolizes to someone, every American has hope for not only his future, but also America’s future.